Possible spoilers for Netflix's The Punisher. I'm not a Frank Castle fan. That's not to say I wasn't one before. When I was very young, I REALLY enjoyed the tales of The Punisher. A guy with guns, a bullet vest and no superpowers is out on the streets taking out bad guys and giving the superpowered elite trouble? Sign eleven year old me up! Then I started to grow up and the problems I were beginning to have with Batman begin to show up in a more substantial way when I really looked at Frank Castle's one man war on crime. Sure, The Dark Knight and The Punisher were taking out criminals and the bad elements of their cities, to varying degrees, but who were these people and why did these two guys have the right to take down people they thought were bad? And, really, I get that that is an argument for any superhero/vigilante/antihero who chooses to take the law into their own hands but The Punisher was KILLING people. They weren't webbed up on a light pole for the cops to collect later. These people were DEAD and that was it. Frank was just killing the bad guys from a place of revenge for gangsters taking his family and that morphed into this war on crime. 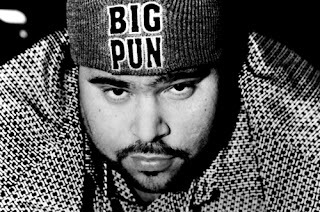 All crime. He lived in a world of black and white and good and evil and I was realizing that the world was very much not like that. The Punisher would have to take the backseat in my fanboy life for awhile. Maybe for good. He was problematic. As was this Punisher that I began to listen to around the same time in my life. 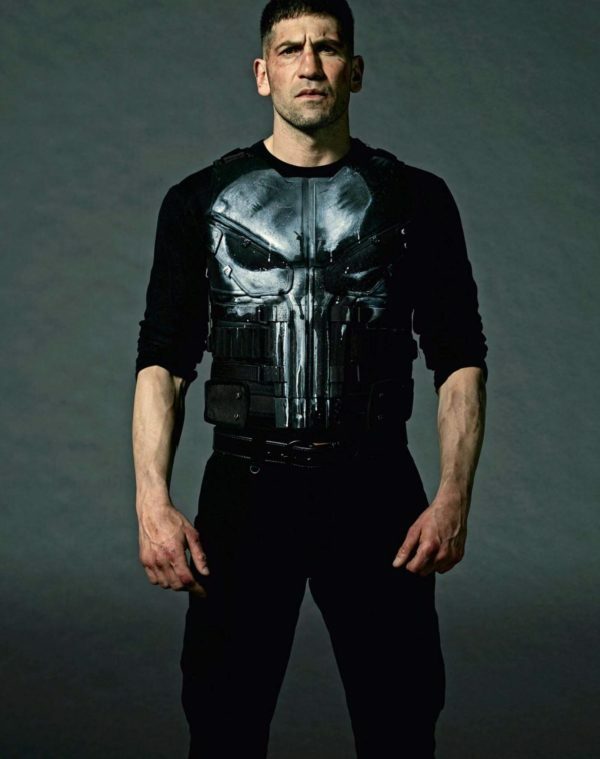 So, I was off The Punisher fan train for awhile. I followed the pursuits of less murderous heroes and was good for many years. Sure, I had the Ecko Punisher vs. Rhino shirts and loved skulls but I was no longer a true fan of Frank Castle. I watched his movies (War Zone was great) and saw him in cartoons and read stories when he popped up in a crossover but still, not a fan. Then the MCU began and Netflix started making shows and Daredevil began it's second season. Frank Castle had entered my life again. 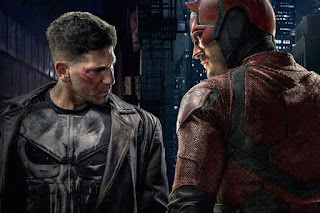 To be honest, it was fun to see a foil to Matthew's holier than thou moments and The Punisher is perfect for that in all mediums. He is the unchecked rage that Matt tries to temper so he fits in the series. 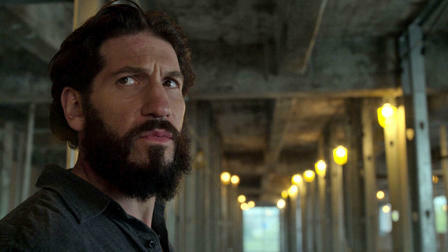 Jon Bernthal is a great actor and choice for the role. But he was still too psychotic and wild for me. There was a backstory being built on his origins from the comic book days but it still was only barely enough to make me give this yelling, snarling man with tons of guns a past. The Punisher was still very one note to me and I was only mildly invested in Castle's story at this point. He was getting a series and I knew I would watch it but was pretty sure that he needed a massive heart and soul added to his character for me to become a fan again. Well, I might be a fan again. At least of this version of Mr. Castle. Frank begins the series finishing up leftover work he had started in the Daredevil series and basically retiring his Punisher bullet proof vest. He is just a quiet construction worker in what appears to be Queens or Brooklyn, keeping his head down and knocking down walls with a sledgehammer all day and night to avoid his PTSD and nightmares. Frank is trying to stay under the radar and live a solitary life alone. This obviously doesn't last and he is pulled back into killing mobsters and I think "Great. This again." But then the series gets interesting and Frank is pulled into the world of David Lieberman aka Micro and his quest for truth and justice. A former NSA analyst, Micro wants to expose the corrupt government and military officials who tried to cover up their crimes and "killed" him. Frank becomes an uneasy ally in his quest for revealing the criminality of these high level players. In the course of this mission, Frank doesn't return to rage monster form. Well, not entirely anyway. He is more nuanced as compared to his depiction in Daredevil. He is a strategist beyond just setting up kill shots. Frank has to address his own involvement in the crimes of the people he and Micro are taking down. He has to deal with betrayal and caring about others and dealing with real issues. The Punisher becomes a human again by interacting with others and not just whacking minor crime figures. I mean, he does that too but he also connects with an old soldier friend, David's family and, of course, Karen Page. Of course, it involves violence but baby steps. Frank also has to deal with a soldier who is also going through his own struggles and is committing terrorist acts in a twisted emulation of The Punisher's own mission. Frank has to deal with this man and illustrate why they aren't the same and how honor and a code can make a man better. Frank follows rules so he doesn't slip into just being a person practicing violence when it isn't necessary and especially not at the expense of the lives of the innocent or people just trying to uphold the law. This is evident when he dispatches a soldier in a tunnel without killing him or when he escapes a building by incapacitating two cops but not killing them. Frank's code isn't perfect but it definitely makes him less of just a man with a gun shooting people who are bad. Most importantly, I think this series does a good job of showing how a soldier has to adjust to returning to a civilian life when the war is over. One of Frank's friends is a Corpsman named Curtis Hoyle who has lost his leg and runs a support group for veterans. He is Frank's ally and aids him when necessary but also wants Frank to try to re-enter the world after he has gotten vengeance for his family. He is the example of a soldier recognizing that issues still exists that he has to deal with but he also has to rejoin society. Frank eventually comes to a similar realization by the end of this season. He joins the group and explains his own problems with getting "back into the world." But, Frank is trying and that is a step in him becoming the man he used to be. Frank Castle isn't perfect. He engages in violence on a very unhealthy level and has moments where he is consumed by it. Frank is trying though and this series shows that process. It makes me think I can give The Punished another chance. He doesn't have to be a crazed vigilante. He can just be a veteran dealing with getting his life back together with some cools battles thrown in the mix. I gave this series a chance and enjoyed Frank's tough and emotional journey. I think you would as well. 5W Friday Panel: Ranking the Marvel Movies! 5W Friday Panel: The 5W Holiday Gift Guide!